En el próximo número de la revista Nueva Sociedad, "Política y ciberactivismo hoy," tengo un articulo titulado, "Entre 'oficialistas' y 'mercenarios': Cartografía de la blogosfera cubana." En el artículo analizo las historias de los diversos movimientos de "bloggers" cubanos. Va a salir el 1 de octubre y estará disponible gratuitamente en Internet. Aquí esta el indice y el resumen del contenido - editado por Pablo Stefanoni. Omar Rincón. Mucho ciberactivismo... pocos votos. Ted Henken. Una cartografía de la blogósfera cubana. Hernán P. Nadal. Testimonio: ciberactivismo y medio ambiente. Internet se ha vuelto parte de la vida cotidiana de cientos de millones de personas en todo el mundo, y la rápida mutación tecnológica en la arena virtual tiene, sin duda, efectos sociológicos que aún no se han terminado de establecer. La introducción de la web 2.0 agrega a su vez una nueva serie de complejidades, ampliando las posibilidades de los usuarios de transformarse en productores de contenidos y en ciberactivistas. No es de extrañar que los efectos de estos cambios llegaran rápidamente a la política: miles de personas salieron a las calles en Túnez y Egipto –y en otras naciones de África y Oriente Medio– y de inmediato surgió una discusión acerca del verdadero papel de la web en la «primavera árabe»; muchos candidatos apuestan con más o menos éxito a reconstruir mediante la red de redes el debilitado entusiasmo juvenil por la política; otros luchan desde internet en defensa del ambiente, contra las corporaciones y contra diversos regímenes autoritarios, y no pocas veces en favor de causas reaccionarias. Todo ello motivó a Nueva Sociedad a abordar el ciberactivismo, tomando en consideración algunos casos en América Latina y en otras partes del mundo. El objetivo es ponderar las potencialidades y los límites del fenómeno, más allá del escepticismo hacia la ciberpolítica, pero también más allá de los optimismos excesivos que hacen perder de vista la «materialidad» de la política y de las relaciones de fuerzas. Above is the 61-minute video of today's live Q&A between my students and a number of Cuba's leading bloggers. You can read a summary (in Spanish) and also view and download the audio/video file of the entire live interview at the Martinoticias website. Radio Marti and Martinoticias.com today! Today, Thursday, September 22, from 11 a.m.-12 p.m. Radio Marti, together with Martinoticias.com will host an interactive exchange between my students here in New York and the Cuban bloggers Yoani Sanchez, Miriam Celaya, Dagoberto Valdes, and Orlando Luis Pardo Lazo. The conversation will focus on the state of the internet in Cuba today and possible future scenarios given the (eminent?) arrival of broadband. The event will also be an exchange of information of what technology is available in the island and how it can be supported, enhanced, and assisted. In preparation for the event, each of my students has done some background reading on blogs and internet in Cuba and submitted one discussion question that they will pose directly to the bloggers. Among the background readings are: Yoani Sanchez’s book Havana Real as well as the following interview I conducted with her back in 2008 about the Cuban blogosphere: “Desde Cuba with Yoani Sánchez: From Verbal Violence to Citizen Cyber-Journalism." A 13-part video of the same interview can be viewed here. "In your 2008 interview with Ted Henken you mentioned that 'a blog is a little push against the wall.' So has your blog helped push Cuba forward in any aspect or brought any change in Cuba. And who would call your inspiration and why?" "Who do you want your message to reach? The United States, Europe, Asia, or other Cubans? And why spread your message through the internet when it's very hard to get internet access in Cuba?" "In your interview to Ted Henken you called your blog a 'little push against the wall.' A Russian proverb says 'knock and the door will open.' Let us hypothesize that the 'door' finally opens. The scenario used by Gorbachev 1991 proved to be way too abrupt and caused lots of socio-economic problems for all post-Soviet countries. Moreover such a change in the political regime was rather harsh for regular citizens to adjust to. Do you believe it is possible to fix a few things here and there (through reforms) to make slight and gentle transition from existing regime to another 'more satisfactory' one for all Cubans? If so what kind of reforms are the first to take place?" "Yoani, en su ultima entrevista con elnuevodia.com usted declaro que creía que Cuba esta en 'vertigo final' en lo que se refiere a la caída del régimen comunista de los hermanos Castro. Cual considera usted que sera el rol de la comunidad cubana en el exilio, no solo en EE.UU, sino en Europa y otros países cuando esta tiranía se desmorone? Cual sera el papel de los cubanos en la isla? Habra algún tipo de antagonismo entre estos dos grupos? Y finalmente, cual cree usted que sera su rol como 'hormiga demoledora de muros' en la nueva Cuba?" "In your book, Havana Real, you mentioned that instead of not revealing your identity as most bloggers did and still do, afraid of the consequences, you have chosen to do so. You literally put your family and yourself at risk for your deep commitment to the truth. Given the consequences that future generations will undertake, such as of your son, due to this activism of bloggers in Cuba, I am very much interested in understanding your thought process and what you told your son when you made the decision of revealing your identity." "A survey of notable 20th century Authoritarian and Totalitarian regimes indicates that through the misappropriation and perversion of language these actors sought to claim the moral basis for governance from their dissenters. So we can look at an East German police state billing itself as the Die Deutsche Demokratische Republik (German Democratic Republic) while taking its mandate not from the democratic will of the German people but from frustrating German democracy in the service of Marxist-Leninism. Similarly, we can look to Portugal’s Second Republic which promised the masses an Estado Novo (New State) in 1933 but then spent the next forty years defending the corporate, colonial and Catholic interests of the old order from the political currents of free trade, anti-colonialism and the separation of church and state which gave rise to the modern states of western Europe. Counter-intuitively these regimes, one right wing and one left wing, were the antithesis of what they purported to be. Mindful of this history I was intrigued by the answer you gave Professor Henken in 2008 wherein you discussed the evolution of the title of your digital magazine from Consenso (Consensus) to Contodos (With All). At that time, you explained that you had come to the realization that you were not looking for consensus but searching for diversity and pluralism. Three years forward, where has that search led you? Having exchanged ideas and viewpoints with others has it not led you, as a citizen, to observe within the blogosphere an emerging consensus of what Cubans want of a post-Castro Cuba and is it fair to say that while you were not claiming consensus in 2007 that you were, in fact, seeking to arrive at it?" Even though it's obvious that all the inhabitants of Cuba should be taught how to use the internet and how to voice their opinions, it seems to me that priority lies in the adolescents and youth of your country, being that they are the future. My specific question to you is how do you plan on teaching people how to let the outside world know what is going on inside? You talk about how Cubans find 'holes in the wall,' so what hole will this be? "As I was looking over your blog Generation Y, I noticed that you post at least twice a week, posting a different topic each time, do you find it difficult to maintain that sort of standard of frequency? O do you just post when you get the chance? As I understand it, it is hard in Cuba to even access the internet, yet you manage to do it weekly. In the case that you are unable to blog, do you keep notes of what you would have like to blog or just remember it till next time?" "Yo puedo imaginar que en Cuba no todo mundo puede estar de acuerdo con tus pensamientos en tu blog. Solamente hablando con mi propia familia, que vive en Cuba, puedo deducir que la gente está bien separados en sus opiniones. Y ahora, con todo el cambio que esta pasando, esa diferencia es mas aparente todavía. Como tu has mantenido tus amistades con tu blog? Has perdido amigos? Y que otras dificultades has encontrado en este viaje, en termino de tu vida social?" 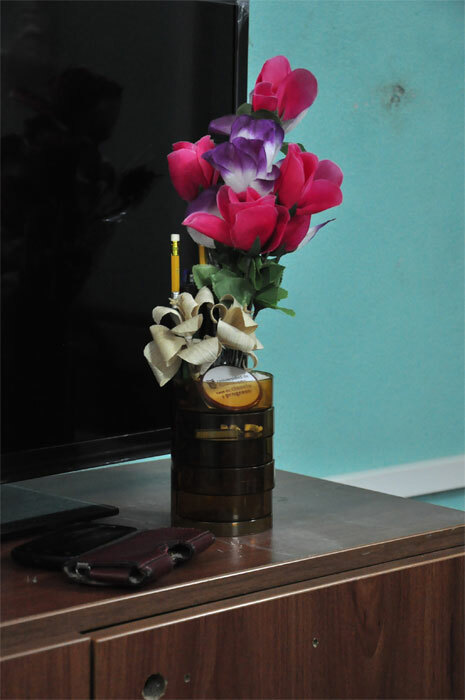 "Not too long after you began your blog, Fidel became ill. Shortly thereafter he handed over power to his brother Raul. Can you describe the differences, if any, in the difficulties you've dealt with while producing your blog under Fidel and under Raul? Has it become easier for you to continue your work? Also, has there been any change in freedom of speech and the press in general since the handover of power? If not, do you believe that in the near future, under Raul, things will change with regard to speech and information? And can you describe the current state of freedom of speech and the press." 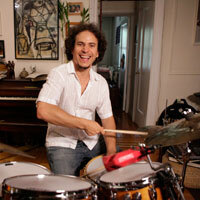 Dafnis Prieto is a percussionist whose dazzling technical abilities electrify audiences and whose rhythmically adventurous compositions combine a range of musical vocabularies. A classically trained musician who absorbed from an early age the multifaceted percussive traditions of his native Cuba, Prieto transposes elements from his Afro-Cuban musical heritage onto a jazz drum kit, incorporating congas, timbales, and the layered rhythmic patterns of rumba and son. Whether performing as a solo artist, bandleader, or sideman, his playing is characterized by a finely calibrated command of textures and nuances and an ability to execute highly complex, polyrhythmic structures with extraordinary speed and precision. As a composer, Prieto melds modern jazz harmonies, Cuban clave rhythms, other Latin and African influences, and funk-inspired arrangements to create works of great stylistic diversity that evoke a broad spectrum of moods. His 2006 recording, Absolute Quintet, showcases both his powerful and propulsive playing as well as his interest in composing for a nonstandard ensemble of organ, cello, violin, saxophone, and drums. The morphing rhythms and time signatures of Taking the Soul for a Walk (2008) further demonstrate Prieto's compositional reach and graceful way of slowing down or speeding up a given tempo. Through these and other recordings, his leadership of numerous ensembles, and additional projects involving dance, film, and opera, Prieto is infusing Latin jazz with a bold new energy and sound. Earlier this week, I returned from a 10-day vacation in Guatemala (more on that on Twitter and here later). I'm back on the blog and will be posting some juicy items in the coming days. For now, I wanted to alert all Cuba-watchers that I'll be teaching a class during the fall semester entitled, "Cuban Culture and Society." The photo above shows the 7 books (!) that I'm using in my class. Thus, the picture is worth the 2,310 pages contained in these seven books. 1. Cuba: What Everyone Needs to Know. Julia E. Sweig. Oxford, 2009. 2. The Prison Letters of Fidel Castro. Edited by Ann Louise Bardach and Luis Conte Aguero. Nation Books, 2007. 3. Havana Real: One Woman Fights to Tell the Truth About Cuba Today. Yoani Sanchez. Melville House, 2011. You can to the publisher’s book website to view two subtitled videos of Sanchez describing her purpose in blogging and reading some of her posts aloud. 4. Havana Fever. Leonardo Padura. Bitter Lemon Press, 2009. [The original Spanish novel is entitled, La neblina del ayer (2005)]. 5. Without Fidel: A Death Foretold in Miami, Havana, and Washington. Ann Louise Bardach. Scribner, 2009. 6. Cuba: A Global Studies Handbook. Ted Henken. Santa Barbara, CA: ABC-Clio, 2008. 7. 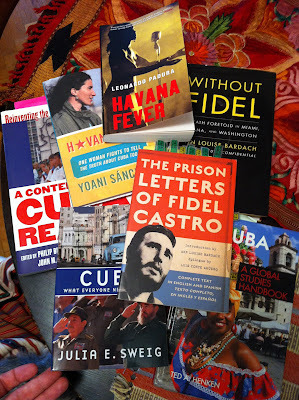 A Contemporary Cuba Reader: Reinventing the Revolution. Edited by Phil Brenner, Marguerite Rose Jimenez, John M. Kirk, and William M. Leo Grande. Rowman & Littlefield, 2007. For those interested, you can go HERE to take a look at my full syllabus! Q&A with Cuban Bloggers live on Radio Marti: On Thursday, September 22, from 11 a.m.-12 p.m. Radio Marti, together with Martinoticias.com will have an interactive exchange with Cuban bloggers Yoani Sanchez, Miriam Celaya, Dagoberto Valdes, and Orlando Luis Pardo Lazo via telephone about the state of the internet in Cuba. (Radio Marti would like to include others, but some bloggers only have silence for Radio Marti...). The conversation will take place live on the radio and live on the Martinoticias.com web page. The event will be an exchange of information of what technology is available in the island and how it can be supported, enhanced, and assisted. Based on class readings, all students have to come up with a single, well-developed question they will ask the bloggers themselves live on the air! 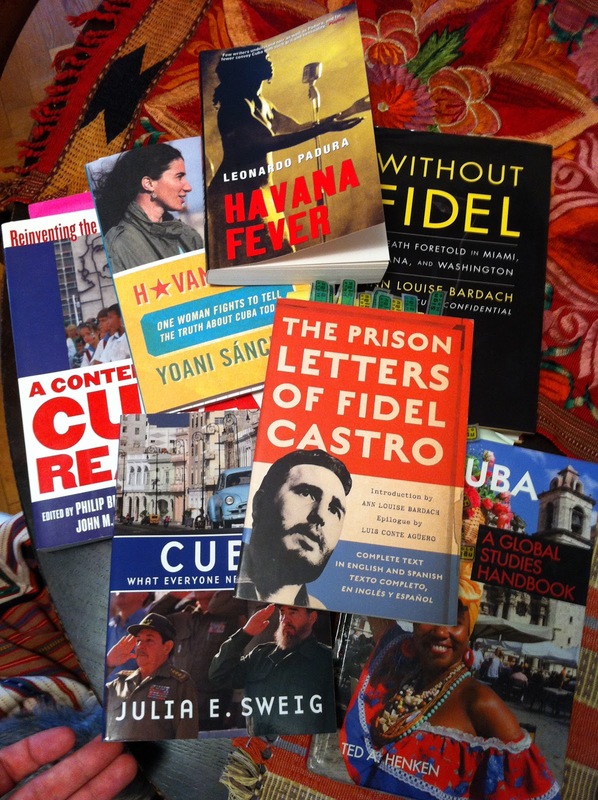 Writing Assignment – Fidel’s letters and Yoani’s blog: During the semester students will read two surprisingly similar books by two very different authors: The Prison Letters of Fidel Castro and Havana Real by Yoani Sanchez. Each book is both deeply personal and sharply political. The first one collects the personal letters that a very young Fidel Castro (just 25 years old at the time) wrote from prison between December 1953 and May 1955. The other collects various posts from the blog “Generation Y” by the young cyber-activist Yoani Sanchez (just over 30 years old when she began blogging) written between April 2007 and December 2010. In their writings, both Castro and Sanchez describe with rich detail Cuba’s many problems (chief of which is a dictatorial political system) and pose possible solutions. The students' task in this 7-8 page paper is to summarize, analyze, and compare and contrast each writer’s words and ideas. What are the chief problems faced by Cuba (in the 1950s and in the 2000s) according to each author and what does each one propose as solutions. How have the problems changed between each time period? How is each writer’s background and writing style similar and different? Finally, consider each writer’s use of their particular medium (letters vs. a blog) to communicate their ideas and garner support and solidarity from potential supporters. How do they relate to and negotiate with the authoritarian political atmosphere in which they operate? Finally, compare and contrast each writer’s relationship to forces, actors, supporters, and opponents outside of Cuba (especially the United States). Mauricio, Welcome to the club! Mauricio Vicent of El Pais has had his journalist's acreditation "irrevocably" suspended by the Cubam government. The Cuban government sure loves that word, "irrevocably." "Is it better to ask forgiveness or permission?" Are Fernando Ravsberg of the BBC and Marc Franc of Reuters next? Remember, there was also Gary Marx of the Chicago Tribune who suffered a similar fate a few years ago. And Anthony Boadle was accused not long ago of being a spy of some sort. For those who don't know it yet, Esteban Israel of Reuters (who originally broke open the Yoani Sanchez story in October 2007) also left Cuba recently after being prohibited from reporting. He's now headed to Brazil, I presume with his wife Shasta Darlington of CNN. Go here for the full AP story on Vicent. I don't know if it is from Paul Haven or Peter Orsi. Consider your banishment a compliment. I know I do.